On Saturday Aug. 6, 2016, the Flea Mart held there weekly cruise in Independence, Missouri. 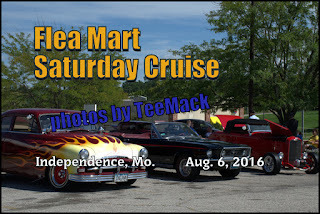 On this particular Saturday they were host to the TV Movie Vehicles replicas from around the area. The vehicles at the cruise included the Smokey and the Bandit Semi truck (Snowman’s Dream), The Back to the Future Deloren, Herbie the Love Bug, The Twister Tornado Pickup, the Bluesmobile, The General Lee and the Dumb and Dummer Van. Click here to view individual photos or to purchase high quality prints.